talkRADIO presenter Kevin O'Sullivan sitting outside his tent. Kev spent the night sleeping in a tent in a tunnel in the town, along with "Homeless Hero" Tony Long. The Matthew Wright show launched the campaign on Thursday to support the journey of Tony and Patrick O'Brien, as they march more than 100 miles to raise awareness of mental health. 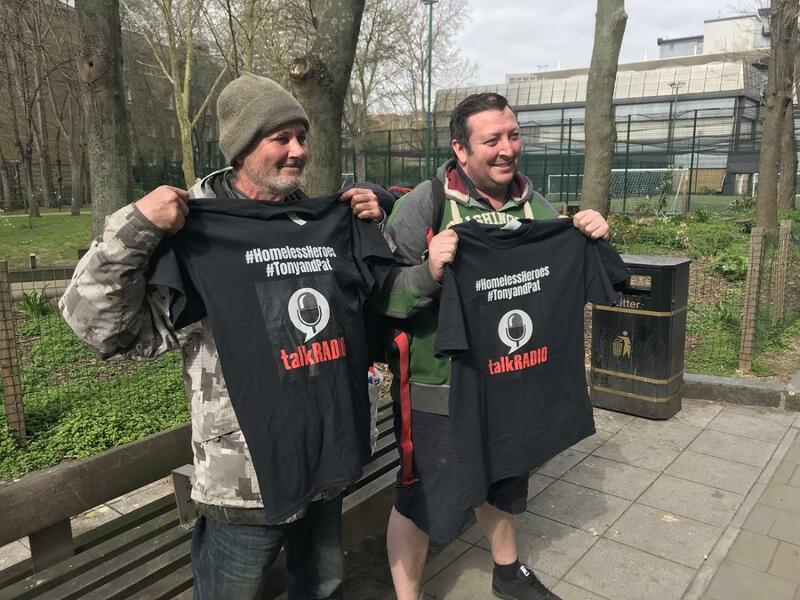 The two homeless men both suffered with mental health issues, which led to them living on the streets outside of the talkRADIO studios. On Thursday, the two men set off on a walk from Brentford to Bristol to raise awareness of mental health but Patrick had to drop out over his health. Following his night on the street, Kev said he had not considered the “sheer boredom”, but also the "low-level terror" of being homeless. “Tony is great company but imagine if he was sat here for hours with nothing to do,” he said. However, Kev added that he struggled to sleep throughout the night as the pair’s sleep was continuously “disrupted”. “There were three interruptions,” he said. “The first was from a copper who was looking for a missing person. “Then there was a guy who demanded to see my trousers. We suspected that they had been mugged and were looking for someone. Tony Long and Patrick O'Brien before they set off. Tony told talkRADIO that being homeless means that he constantly worries. “I am reluctant to lie down because that is when you are most vulnerable,” he said. “It has particularly been the case on this journey because everything is new. Tony had since walked to Maidenhead with the hope of reaching Bristol by Easter Sunday. Matthew has said he will whisk him off to a Hawkwind gig in Frome, where the band will greet them on stage. talkRADIO is working with homelessness charity Emmaus UK to raise money for Tony and Pat's cause. Anyone that wishes to donate can click here.